Here's a big fat living room spoiler. I've been waiting for the sun to show its face so I can get some good photos of our living room, but when your work outfit matches your home decor, you kinda have to show it off. This is what I wore to work at ABM this week. You can see my other "Out To Work" posts here. I love your living room! It's so cute. And the fact that your outfit matched it is even cuter. Love the cardigan you're wearing! Loving the chair and the hunters! Nothing like rocking a welly boot look! like this. look so cute. so cute! love the boots - i finally got a pair of hunters this year and am so happy i splurged :). Can I move in? Such a beautiful space! Gahh that chair is amazing!! Very sweet, you perfectly match your chair! It's still definitely hunter boots weather here too, mine are not quite as smart as your though! Ah, fantastic! It happened to me the other day! I was wearing owls and red just like my bathroom! your home and outfit are gorgeous! Your living room looks so cozy! LOVELY! I LOVE THE COLOURS OF YOUR OUTFIT! 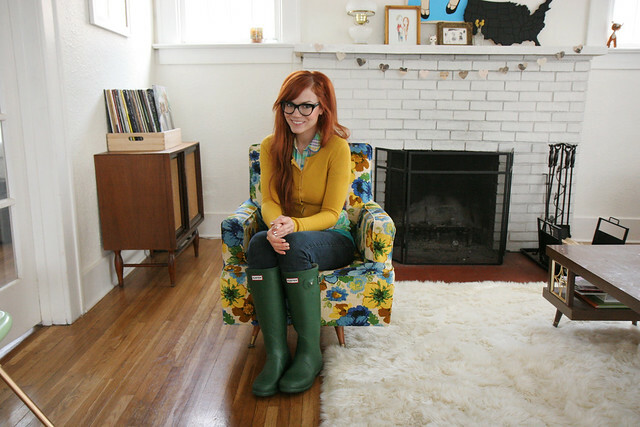 I love that you matched your super cute chair! 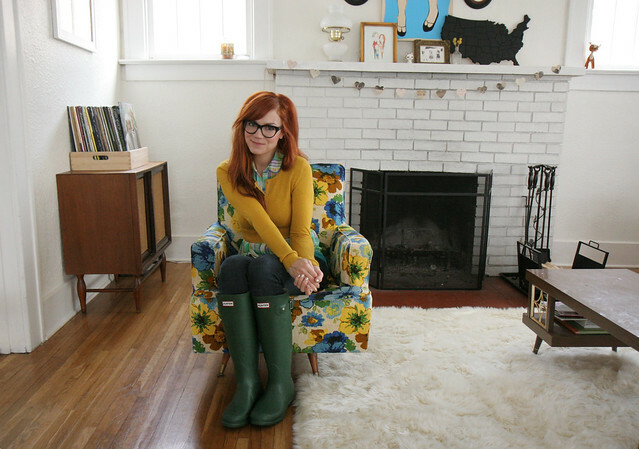 Such a cute outfit and I like the way your clothing style and decor go with each other. Very well defined! I was going to say, did you purposely mean to match your outfit to your chair. Love them both! i love your chair! amazing! Where is that fabulous chair from? I am moving into a new apartment and absolutely LOVE it! I just want to roll around on that rug, in my own home of course! haha. Also, you are adorable. As always! So cute! I love your chair too! You are super cute and I love the living room! Love the chair! I have one very similar to it!